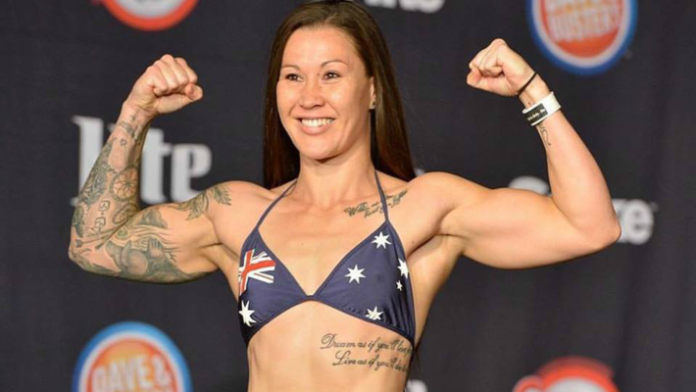 Bellator’s featherweight division keeps on rolling when Arlene Blencowe takes on Amber Leibrock at Bellator 206, as reported by Geelong Advertiser. Australian Arene Blencowe has a professional record of 10-7. Prior to losing her featherweight title fight against Julia Budd by split decision at Bellator 198, Blencowe had strung together three consecutive victories in the division, over Rhiannon Thompson, Janay Harding, and Sinead Kavanaugh. Blencowe also had met Budd once before her split-decision loss to her in an even closer contest that rendered a majority decision for Budd. Blencowe will look to potentially create another winning streak to merit a trilogy with the reigning champion. Amber Leibrock only has four professional fights to her name. When juxtaposed with her opponent’s 17 professional MMA fights and eight professional boxing fights, Leibrock certainly has a large experience gap to account for. Leibrock is a former member of the Invicta roster, where she earned two first-round TKO victories and a Fight of the Night against Megan Anderson at Invicta FC 15. Leibrock is also 1-0 in Bellator, picking up a unanimous decision over Janay Harding at Bellator 199. In addition to this bout, the main event for the card will be the much-anticipated bout between Gegard Mousasi and reigning welterweight champion Rory MacDonald. The Welterweight World Grand Prix will also begin at this event when Douglas Lima faces Andrey Koreshkov in a trilogy bout. Also, Quinton “Rampage” Jackson will face Wanderlei Silva at the event to culminate the longstanding feud between the two legends. Bellator 206 takes place September 29th, 2018 from the SAP Center in San Jose, California. And will air exclusively on the DAZN streaming service. Whom do you think wins? Arlene Blencowe or Amber Leibrock?